Solar photovoltaic (PV) systems are being installed in ever increasing numbers throughout the world and are expected to safely and reliably produce electricity over several decades of operation. However, many systems are not satisfactorily evaluated prior to being put into service and many have little, if any, scheduled maintenance or testing over their lifetime. Unfortunately this leads to unsafe and under-performing systems with reduced value to their owners. Any electrical system can be tested to verify performance and to evaluate the condition of wiring systems and equipment. 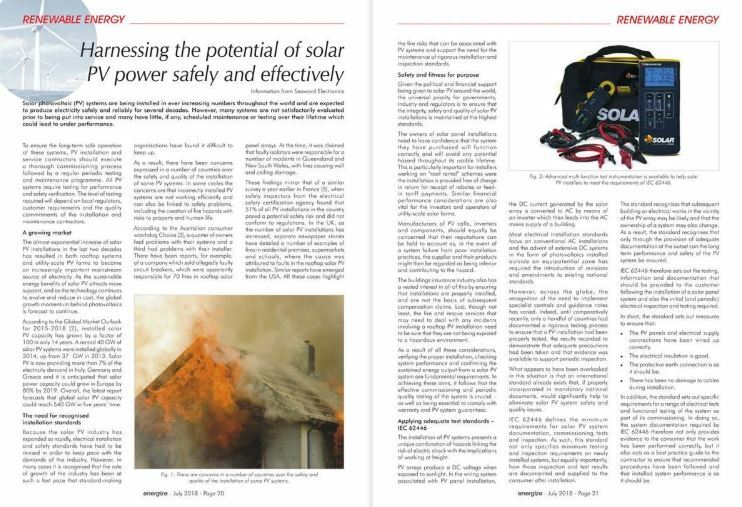 This is particularly important for PV installations which can be subjected to extreme environmental conditions and deteriorating effects of the elements over many years. To help ensure the long term safe operation of these systems, quality PV installation and service contractors execute a thorough commissioning process followed by a regular periodic testing and maintenance programme. These practices can help to promote safety and optimise performance, and provide essential information to those who may need to effectively troubleshoot, diagnose and remedy any problems arising with the system. In this way, all PV systems require testing for performance and safety verification. The level of testing required will depend on local regulators, customer requirements and the quality commitments of the installation and maintenance contractors.